East Runton School belonged to the Buxton family, who subsequently leased it to the Norfolk Education Committee. Ownership eventually passed to Epsom Estates. Sir Fowell Buxton (died 1919) paid for services to be held in the school from at least the 1890’s, and these were taken by the Revd. H.C. Fitch, the rector of Beeston. After Sir Fowell’s death they were continued by his son, Sir Victor Buxton until his death in 1918. His son, the next Sir Fowell Buxton, did not continue them but he did give the land where the Chantry stood, in Broom Hill. The Chantry was a World War 1 Army Hut. These were sold off after the War. The Workers Club at West Runton was originally one of them and others were bought by people in Runton. The Chantry Hut was given by Miss E.L. Aldis of West Runton and it was licensed for worship on 3rd August, 1923. The Rector, Canon Matthews revived the Midnight Mass of Christmas in the Chantry in 1923. Various persons, including visitors, gave items for the Chantry – the brass alms dish, still used at St. Andrews was one of these gifts. It is thought that services in the Chantry ceased after the outbreak of war in 1939. The Hut was sold in 1944 for £94-7-0d, and the land was leased out, there were chickens on it at one time. Fast forward to the present and we see a dwelling built there. Services recommenced in the School on Sunday evenings in 1952 and continued. There were suggestions that a permanent church be built on the Chantry site in 1953, but these ideas were abandoned as there was a suggested scheme, later abandoned, to build a road from somewhere on the Cromer road through to and down Broom Hill as a relief road to the High Street. There have been various efforts to raise money to build a church in East Runton continuing over the years and by August 1957 there was £807 in hand. It was evident by this time that the school would close before long and in 1957 Epsom Estates agreed to sell the school buildings (not the School House) to the P.C.C. for £500, and the lease to the Education Committee was extended to 31st July, 1958. The School closed on 22nd July 1958 and the P.C.C. purchased the building in 1959. The lease stipulated that the Education Committee should leave the school in good order and the redecoration of the interior was thus not paid for by the P.C.C... Canon Matthews obtained gifts from here and there, the Harold Buxton Trust gave the altar, other things had come from the Chantry and had been stored at Holy Trinity ( the spare chairs at Holy Trinity are some of those once in the Chantry.) Some seats were obtained from a home in Sussex and the church was dedicated by the Bishop of Thetford, Pat Leonard, on the 6th August, 1959. The church was the big room; the Infants’ Room, the present church, was used as a Sunday School. A small sub-committee was formed in 1968 to take special interest in the affairs of St. Andrews. This consisted of five members and the two churchwardens of the parish and at the first meeting a deputy churchwarden was elected. Efforts were made to raise money to maintain the church but the upkeep of the whole complex proved too much of a drain on the parish finances and about 1972-73, the Rector, the Revd. J.H. Bloom had ideas to demolish it, build a small church on part of the site, and sell off the rest for building. This was absolutely opposed by East Runton and it caused a deal of ill-will. 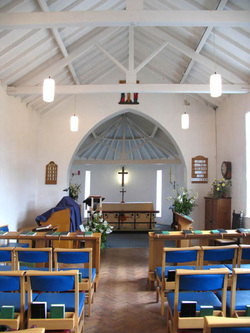 Eventually the main part of the School, the large room (once the church) and the north room and porch were sold in 1977 for conversion to housing, and the Infants’ Room retained for a Church. The wall between the two (hitherto a wooden partition) had to be built and the door on to the common from the Infants’ Room porch opened, as well as a new electricity supply, etc. etc. The work seems to have been finished by the end of 1977 and the new church was dedicated on 16th February, 1978 by Archdeacon Timothy Dudley-Smith. All seems to have cost £5.84.61d. A false ceiling was removed from the room, so that it became open to the rafters, as now. A new committee was formed and more fund raising activities were arranged for maintaining the building. In 1980 the SE wall required re plastering and amongst other repairs, the steps to the entrance were modified to allow wheelchair access. This used up all the money in the building account and it was closed. The PCC agreed to take responsibility for all St. Andrews financial commitments. A large wooden cross to hang over the altar and a white laudian altar cloth was gifted by a member of the congregation. After a very successful Christmas Fayre in November ‘86, material was purchased and green altar frontal and lectern fall were designed and made by members of the church. The Rood, (the Crucifix with our Lady and St. John either side) given by Martin Dupont, was designed by Fr. John Denny and painted by his wife Margaret. After an inspection in 1993 the building was found to have cracks in the walls, a leaky roof, and the window frames were rotting and the lintel over the sacristy collapsing. Repairs were estimated around £10,000. The Revd. John Denny, curate to the parish and an architect prior to ordination, put forward the idea of a major revamp of the building and with Michael Pert, vice chairman of the PCC and also an architect, 5 different plans were drawn up and one was selected. It involved turning around the interior with extensions of an apse, a kitchen and a porch. The people of St. Andrew’s earnestly set about raising the money. Events varied from coffee mornings and flower demonstrations to car boot sales and auctions. There was tremendous support from both the village and the parish. An electric Hammond organ was given on permanent loan from Mr. Stanley Fuller in 1995, and the existing piano and harmonium were sold. The Hammond organ was in service until June 2004 when it was replaced by a 20 year old Wyvern (Salisbury). It was becoming more difficult to get spares; it was part mechanical and required regular maintenance, a bit like a car. The Wyvern, electronic organ kept going, just, until enough funds were raised to buy a new one. In August 2007 a JOHANNUS OPUS 7, was purchased at a cost of £4,650. By September 1996, with over £8,000 raised and an agreement with the PCC to meet the shortfall, Peter Strudwick, churchwarden and architect finalised the plans and work began on Phase 1, the Apse. During this time forty blue chairs were purchased from the parish church at Bournemouth, and the pews were sold for £30 each. A chest for storing vestments was gifted. By November it was ready to turn the interior around, and on Advent Sunday the first Holy Communion at the north end was celebrated by the rector, the Reverend Canon Paul Atkins, with Mrs. Dorothy Thatcher as first communicant. The cost was in the region of £12,000. More money had to be raised before Phase 2, the kitchen, could be considered as the estimated cost had risen to £10,000. Grants applied for were rejected, so fund raising events continued. One in particular was a pantomime “The Emperor’s New Clothes” performed by The Mancroft Players from St. Peter Mancroft Church in Norwich. This warranted a report in the local newspaper, “one of the largest churches in Norfolk was helping out one of the smallest”. They returned the following year to perform Charles Dickens, “A Christmas Carol”. Also some very generous donations were gratefully received. Work on Phase 2 began in February ’98 and discovered a new manhole would be required for the drainage system, estimating an increase of £5,000 to the cost. The building was finished in July and the kitchen was completed by the end of the year. During this time a new Memorial Board to commemorate the dead of World War 1 was made by Robert Martins with financial assistance from The Royal British Legion. At The Annual Parochial Church Meeting, 13th April ’99, two deputy churchwardens were appointed, with particular responsibility to St. Andrew’s. On 3rd September, 2000 a kneeler was gifted by Geoffrey Goodbody in memory of his wife, Janet. This was designed especially for St. Andrew’s by Tom Blythe, a member of the church and a relative of the deceased. In 2002 another one was commissioned to match. St. Andrew’s was licensed for Worship and Solemnization of Marriages in 2001, and on 19th May, held its first wedding. The main door being next to the altar, the guests were asked to close their eyes when the bride arrived to allow her to walk down the aisle from the back of the church! Work began on Phase 3, a porch with a toilet, in March ’03, and took three months to complete. The original plan had to be modified to allow vehicular access for the adjoining property. The glass doors into the nave were designed by Peter Strudwick in the style of St. Andrew’s Cross. The cost had escalated to £21,000. In the September, the original main door was replaced with an emergency door at a cost of £700. The two east windows, replaced in the original style, and with financial assistance from The Ploughlet Trust, completed the project. The whole building was rededicated on Sunday, 28th March, 2004, with a special Eucharist service by The Lord Bishop of Norwich, the Right Reverend Graham James. St. Andrew’s Church continues to be well attended and its congregation, with the PCC, are dedicated to its upkeep.